First, let me congratulate Iron Cook Carl for graduating Sunday. He is now an official Massage Therapist. Second, I have added a new page to Morning Erection. The Ask page is just a place for you to ask anything you would like to know about me. It comes from the many emails I get asking for TMI. I’ve decided to give it. Third, I would like to say thank you to everyone who encouraged me and advised a hiatus instead of shutting down the blog. I can’t explain why I felt the way I did and I don’t know how I happened onto blogging again without realizing it – but here I am. It’s good to be back. The post scheduled for the day after tomorrow is the result of having been tagged by two bloggers. I was required to answer their eleven questions, create a new set of eleven questions and then pass it on to eleven more bloggers. I have fulfilled all the rules of the game and taken creative license at the same time. Thank you to the two taggers and the soon to be eleven taggees. This coming Saturday, March 3rd, Thoughtsy from Thoughts Appear will be guest posting for me. The one main thing I can say about Thoughts Appear is if you ever need a pick me up, a smile or just a huge belly laugh; rest assured you can find it at Thoughtsy’s blog. She is obsessed with Zombies but she’s cool. 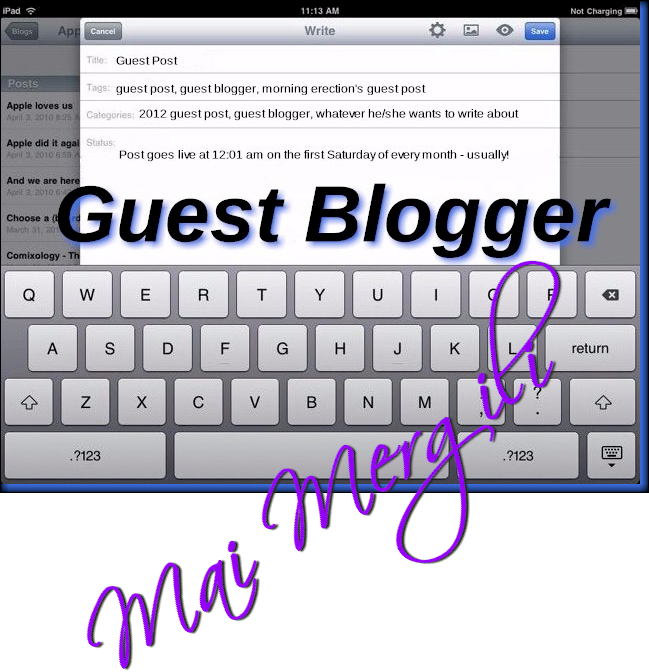 Enjoy her blog before her guest post goes live Saturday. This was a time of many firsts. Thank you for being the first Blogspot guest. Thank you for being the youngest guest I’ve had on Morning Erection and thank you very much for taking the extra effort to post in both English and German versions. There were a lot of new visitors from Google+ and Blogspot and from your blog as well. I know you don’t care too much about comments however with the amount of visitors from your blog, I would have imagined there would have been more. I am honored to have had someone with your skills post on my blog. Thank you. Next weekend will be the regularly scheduled Guest post for March. The wonderful guest will be Thoughtsy from Thoughts Appear. Please come back next Saturday, March 3rd to enjoy her post. Please welcome my friend Mai Mergili from Pencil Pillow to Morning Erection’s monthly guest post. Mai has a great blog and I knew when I read it the first time I visited that I wanted her to guest post for me. She willingly and graciously agreed to be my guest here and in doing so has become my youngest blogger and my first blogger not on WordPress. It takes a lot to successfully run a blog and in creating this guest post I know it took time away from her blog. Thank you for taking that time, Mai. Readers, as a favor to me please show Mai the courtesy of leaving comments. Thank you very much. The 7th of October 2011, opening my Hotmail. “PLEASE MODERATE, Tom Baker commented on …”. That’s the way I begin all my blog posts, so here we go. If someone told me I would make a guest post on a blog called “Morning Erection” six months ago, I would not have believed it and smiled insinuatingly. But on the said day, Tom commented on one of my entries, and then he subscribed to my blog and after that, he actually commented on almost every entry of mine, in such a constructive and sweet-natured way; what else I could do, except to agree when he asked me to guest post – and “Morning Erection” has got something so provoking and catches the people. The matter of fact that Tom has entrusted me an entry on his blog which was going to take place in almost a half year was a great honour to me who had just begun to blog and take photos. Before I knew it, it was already February and it took me a while to prepare a post. I don’t have a clue what to write as a guest blogger, this is my very first time and words aren’t actually my language, you will see what I mean. But I agreed … on the one hand, because I like Tom and his blog, and on the other side, because he said that “I could be a model” (girls, let us be honest … that would also win you over). Last week, on the way to the city with one of my friends, she asked me: “Tell me, do you prefer being in front or behind the camera?”. I had to finish smoking the cigarette first before I could answer “I don’t have the faintest idea”. Furthermore, she told me that I am doing it well in front, but also behind the camera, which made me smile. Of course, I couldn’t leave it at that and twisted my mind. Standing behind the camera has immensely various advantages; you can take a picture of what you like, from every angle and you can give proper instructions. You are the one creating the stage setting, writing the screenplay and choosing the right costumes – you’ve got the power! But who doesn’t want to be in the spotlight wearing nice dresses? Who doesn’t want to have nice prints of yourself being in a perfect designed coulisse? 1) I was born almost 17 years ago in Bangkok. My parents always tell me that already as a three yo girl, I always wanted to wear flower dresses and pink skirts. As proof, we watched the old videos of my childhood and looked at the photos and in addition to that, we recognized that I permanently forged ahead in the foreground (almost exhibitionisticly!). Unfortunately, or maybe also luckily, these two attitudes have continued taking shape and I devised a noteworthy passion for fashion and photography. My blog is my outlet and the opportunity to show what these things really mean to me and conveniently, these two things can be well connected. I don’t want to sound like a “vintage loving hipster girl”, but clothes are simply what represent you, and they show the world what you have decided and what you are or want to be. Yet fashion is not just going shopping and paging through the VOGUE, getting inspired and envying the 1,80m models and after all, you copy them. Fashion is like drawing – in the end, original complete works come into existence. If somebody copied someone’s painting or if a writer stole someone’s idea, he would be doomed; why doesn’t fashion count then. It is the choice of shape, cloth and colour that something beautiful and transcendental arises. Okay, this all sounds very serious, though I actually “rebel” against this rigid comportment, because first of all, I go shopping maybe once a month (at the utmost!! ), secondly, meanwhile, I barely read fashion magazines and last but not least … I sometimes wear the same things three times a week. That’s the nice side of fashion, that is to say, there aren’t any rules (okay, in former time, you said “no socks with ballerinas”, but come on …). Thank God there aren’t any rules! What would world be if there were rules for fashion? Horrible! As long as you can do or don’t whatever you want, I am dedicated. But I would immediately lose my passion for this business if they said that you haven’t the freedom and right to decide anymore. Fashion is one of the rare things in the world which leaves us the entire freedom of opinion. I don’t randomly grab in my closet (sometimes yes, on really lazy days), but I deal with it really fluffily. I shake my head because of people wearing 15cm high heels at the airport or in school. “Shut up”, I say to the girls who quote magazines like JOLIE or GLAMOUR. Your clothes have to conform to your life and not vice-versa. Everything else would be cramped and wanna-be-like. 2) Now let’s talk about the second aspect. Sometimes when I see myself with my clothes on photos, I have to swallow. I’ve got a huge self-confidence with a few scratches, which is just normal, apart from that, I would be a narcissist. But I mentioned that I am Asian. Nevertheless, I live in Germany, however, I visit my family in Thailand every year – but as soon as I see all the rickety girls whose mass density might be lighter than the air’s density, I would like to face palm myself or bash my head against a wall. Furthermore, there are those family celebrations and every time I don’t manage hiding and running away from my relatives, I have to have a conversation with them and sooner or later, they say something like “You are a pretty girl, but your legs … your legs … just look at your cousin’s legs, she has nice legs” – but when I look at my cousin who is like 1,65m but weighing 45kg, I would rather say “EHHHH NO? !”, although I am 10cm smaller and 3kg heavier. So, looking at pictures of you is like looking in a mirror. And then, there are people who look just brilliant on pictures – but there are also people, and these people impress me much more, who let other people look good on pictures and that’s the reason why I wanted to have a camera for my 16th birthday. Of course, I cannot objectively say whether I have achieved my aim, but on the other hand, some days ago, I have already written a long article about how much this whole thing means to me, sentimental gibberish! So I blank the idea of success and non-success because that’s not the essential thing anymore. The question is what happens if we connect the first and the second aspect, fashion and photography because they would add up to a great chance. A chance which makes it possible to express a lot and which is really exciting. Normally I don’t write a lot like this. Normally, for me, it works totally differently. Let’s go the whole hog. A great compliment for Tom and his blog. I would like to say “THANK YOU” to Tom and to everybody who has stood it till the end. This entry is due to Tom and now, something less exhausting for your eyes!